It is time for another edition of Show Your Stuff. I have attempted again to make a lower fat cookie. 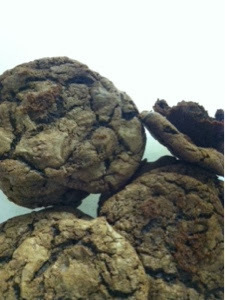 I had some apple butter to use up and substituted half the butter on my Death By Chocolate Cookies. It turned out to be not a really good idea. It wasn't bad, but the flavor of the apple butter really over shadowed the chocolate. I might of been better using the apple butter in a cookie like Oatmeal Raisin or a spice cookie. We never know till we try, right? I don't think I would have thought to use the apple butter. Thanks for sharing with SYC.